Here's your chance to WIN that Halloween Contest and be the hit of the evening! Join the APA for our “Halloween meets Dia de Los Muertos” SFX Make-up Workshop on Saturday, October 10 starting at 8:45 a.m. This workshop is a MUST for everyone who loves celebrating Halloween, Zombie Walks, Comicon, Mardi Gras and Dia de Los Muertos. Local Makeup Professionals APA Member Aeni Domme and Alli Bee from Shampoo Ink will show you how to achieve amazing professional results with effects make-up at home. Don't make costly and time consuming mistakes - learn from the PROS! Sixth in our series of Monthly Workshops, this will be a three-hour seminar from 9:00 am to noon, with LUNCH and a Q&A after. - Make up for Zombies 101- Taught by Alli Bee. Learn how she has developed her own style with cutting-edge techniques to make you look "Simply, Just Dead!" - Dia de Los Muertes Characters - Join Aeni Domme, and learn what's involved in creating the perfect make up for a Dia de Los Muertos character! - Pretty Kitty or Handsome Alley Cat! Faint of heart? Don't have lots off time to get made up? Need something simple for work? Or would you like to do something cheap and cheerful with the kids? Here's a quick and easy character that will get you noticed! RANDY MURRAY PRODUCTIONS will be hosting this event and providing lunch! Randy Murray Productions provides powerful storytelling for positive change. Award-winning, highly skilled and genuinely nice people, they create socially responsible content for screens of all types. They are fearless artists, producers, directors, writers, explorers, passionate livers of life - storytellers - who try to be good humans. They study humanity and technology, explore the beautiful, challenge the horrid, celebrate logic and employ ethics - all to be the best at what they do and tell great stories. AENI DOMME is an Award-winning Makeup and Hair artist in Phoenix, Arizona. Besides making clients look beautiful in film, television and commercials (you've seen her work for clients Dove, Cirque du Soleil, Arizona Theatre Co. and more), she creates characters through stock and custom prosthetics, making wigs, and bodypainting clients for all events and occasions. ALLI BEE is an independent Hair stylist and self-taught Makeup artist currently working at Shampoo Ink Salon in Phoenix. Her interest in the Industry began at a young age, where she found herself studying cult classics like "Evil Dead" and Steven King's "It", creating made-from-scratch Halloween costumes, and later working in salons. She began doing special fx makeup with students from both ASU and UAT for short films, but has gone on to do some commercials and several photo shoots. Almost Everyone is Welcome! Please NO YOUNG CHILDREN. Mature children over 12 must be accompanied by an adult, who must also purchase a ticket if they are not a member. 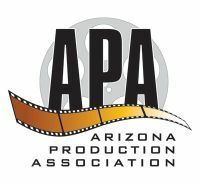 As always, APA MEMBERS GET IN FREE!! If you're not a member yet but you apply PRIOR to the workshop, it's like getting a discount off of your membership dues! Non-members - purchase your ticket to the workshop, and we'll credit the workshop fee to your dues if your application is approved. EVERYONE will need a ticket in advance. You Must RSVP in advance, even if you are an APA Member, no exceptions! The cost for non-members to attend is $20 in advance; $30 at the door - CASH only. $10 for children 12 to 17 years old.